A Point of Transformation is a series of Butoh workshops based on a somatic approach. Butoh is an avant-garde dance movement established in late 50s in post-war Japan. Influenced by German Expressionism self-identity was radically explored with culturally diverse and politically influenced concepts through bodily expression. Somatic is the study of a ‘person’ as a living functional body. Integrating the body, mind and emotion whilst using movement as the main exploratory tool. Seki combines these two approaches to investigate unique individual expression as an art form. Aiming to embody movement, image and feeling state in dance. Experiential anatomy and Developmental Movement drawn from somatic practice helps us understand details and a depth of expression. Shifting attention from ‘action’ to ‘active listening’ and through attentive touch with partner work our perception will be enhanced. We become aware of our physical body. Through this process a subtle flow of feeling and sensation may unfold. Using this sensory feedback as guidance we will make an enquiry into the transformative nature of the body where process becomes the work itself. 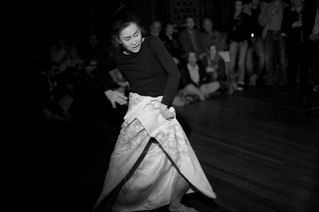 Butoh’s concept proposes culturally diverse ways of seeing, which are often fundamental to our lives. Like life & death, desire and dark human nature. Butoh sees dance as a living process and it pushes the boundaries of what we already know. Working with a concept and imagery a choreographic approach will be developed in exploring what motivates us to shift weight in making movements and how it creates dynamism to structure dance performance. Yumino Seki is a qualified Somatic Movement educator and therapist in VMI (Voice Movement Integration) Somatic Practice. She has been teaching dance to professional performers and member of communities including adults with learning disabilities. Places are limited please book your place in advance. 5 week bi-weekly classes: 4th, 18th April, 16 May, 6th & 20th Jun 2016. 6 - 8.30pm. The Printworks, 14 Claremont, £50 as a course (5 sessions) when it’s booked in advance or £12 as a drop in. 5 week bi-weekly classes: 11th, 25th Jan, 8th, 22nd & 29th Feb 2016. 6 - 8.30pm. The Printworks,14 Claremont, £50 as a course (5 sessions) when it’s booked in advance or £12 as a drop in. The training will be free* for those who are committed to the programme. However places are limited. If you are interested to be a part of this training programme please come to the workshop and express your interest sending a short bio and cover letter stating how you would like to use this training and how you could commit to this programme. *A one-off non-returnable registration fee of £40 will apply.